We now have two trimarans sailing on the Causeway Lake. 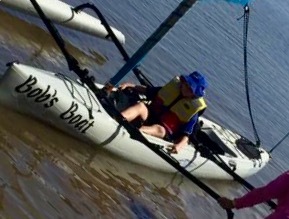 The new Hobie has been named “Bob’s Boat” in memory of Bob Auld who passed away last year. Funding for the boat came from donations in Bob’s memory with the balance made up by Ros. A fitting memorial to one of our most stalwart supporters.